This blog has suffered a bit of neglect over the last year, in spite of the fact that I've been retired since last April. So this is by way of a bit of an update. 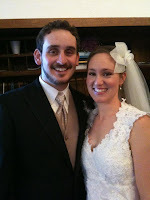 Some of you will know that our younger son, Dominic, the baby of the family, got married in Idaho, in January, to Elizabeth Anne Nelson - who just happens to have the same first two names as my youngest daughter, Libby, meaning that currently we actually have two Elizabeth Anne Crowls in the family. The new Mrs Crowl is normally known as Liz, however. We were blessed out of our socks because a bunch of people from our church decided that we should go to the wedding, even though we'd decided that we really couldn't afford it. So they clubbed together and paid for the airfares - no small sum. We stayed with Liz's parents, Chris and Cindy - along with my other son, Ben, who'd paid his own way, and various other relatives: Liz's brother, Daniel, Liz herself at times, one of Cindy's sisters and her husband, Chris's sister from California, and one of Cindy's oldest friends, also from California - which is where the family hails from originally. So it was a full house for the week. Confused? Liz's family consists of Chris and Cindy Nelson (the parents) and Daniel and Sarah - her siblings. Sarah is married to Joel, whose surname I've forgotten. Cindy has eight brothers and sisters, but only four of them made it to the wedding. We had a great time in Nampa (a kind of suburb of the capital of Idaho, Boise - pronounced Boy-see, and derived from the French word for trees). Nampa is about twenty miles from Boise itself, and we were further out still, in what was a fairly rural area, on a wide open plain where there's no irrigation except via the man-made canals, which the snow off the mountains is supposed to fill up each year. While we were there the snow hadn't arrived at all, and was over two months late. It was mostly like a mild Dunedin winter - very pleasant and sunny. On another tack altogether, while Celia and I were cleaning out some cupboards yesterday, trying to find a particular thing and throwing out other stuff that had survived uselessly for some time, we came across a page of the Joyce family tree that my mother's cousin (now deceased) had put together for me some years back. I'd started to include it on the online family tree, but had never finished. Working my way down the page I was intrigued to discover our mechanic's name! He's married to my second cousin's daughter, Debra Joyce. Celia knew there was some relationship, because Debra's aunt used to live over the fence behind the old house in Stanley St for most of her married life. And Celia had played badminton with her and her sister - who's Debra's mother. So I rang the mechanic, just for a laugh, and wound up with the names and details of his two sons, and their birthdays. If only all genealogy was so easy!